Today I’m blogging about the newest of the pokémon generations: Generation v, Pokémon Black and White (for me it’s just white though). This game takes place in the Unova Region, you start off in Nuvema Town. It begins when you meet up with your friends Bianca and Cheren to get you starter pokémon. In your room you open a box, within it is 3 pokémon: Oshawott the water type, Snivy the grass type, and Tepig the fire type. Once you pick one you go straight to battle. What your friends have depends on what you have. I’m just going to use Oshawott for the example because thats what I picked. 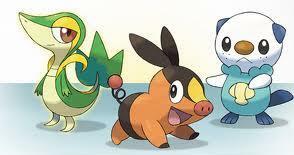 Any who when you battle Bianca she will have a Tepig (if you picked Oshawott that is). Easy, Oshawott is super effective against Fire, easy win. Cheren, though, picked Snivy, still kind of easy since they know 2 moves each. Then you go talk to the Professor – Professor Juniper. She wants you to collect data in the pokédex. Just like all the other games. That’s it, off on your adventure to file the pages of the pokédex and become Pokémon Champion!